Everything you need to know about joining, or visiting, this year’s dig. Please read it carefully! If you're joining the dig team, please remember: LINDISFARNE IS A TIDAL ISLAND AND YOU CAN ONLY CROSS THE CAUSEWAY AT CERTAIN TIMES OF DAY, AND THESE TIMES CHANGE DAILY. If you're coming from the mainland, the first thing you need to do is check the start, finish and crossing times below, to make sure you can get on and off the island in time for the dig. Your first day on site is the most important, as you’ll need to complete the archaeological briefing before we can get you digging or handling artefacts. Make sure you get to our meeting point (Holy Island C of E School) in plenty of time. For people joining us in the second week, we have allowed 25 minutes from the earliest safe crossing time until the start of the day. This should be enough to cross safely, park and find your way to our meeting point, but if it takes you a bit longer, don’t worry – take your time and don’t attempt to cross the causeway any earlier than is safe to do so – the most important thing is to make sure you cross safely! 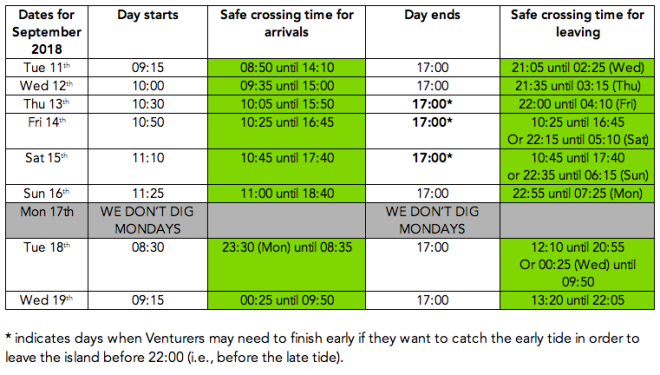 We’ve included the relevant safe crossings below for getting to the dig on time, but you should also check Northumberland County Council’s website for the full tide timetable. There is parking at the main island car park, and the school is just a short walk away from there. Whether you’re a newbie or an experienced digger, joining us for just a day or staying the full two weeks, we’ll do our best to make sure you have a once-in-a-lifetime experience. We’ll make every effort to provide a healthy dose of fun and social activity, but it is still a real research excavation; it’s not your usual relaxing holiday! Fieldwork can be challenging, and weather conditions, daily work schedules and varied terrain are all part of the rich tapestry of archaeological fieldwork. Participants must accept this as part of what archaeologists regularly deal with during research digs, and of what makes DigVentures experiences so unforgettable! So, please prepare to learn, to laugh, to work hard, and to play a bit as well! Once you’ve had your morning briefing, and completed the basic training, we’ll head straight to the trenches. You’ll have an experienced and friendly archaeologist at your side, and before long, you’ll be learning to identify artefacts, spot features and new archaeological layers and record your own discoveries in our online app. The specifics of what we do on site will change daily, but we will always have elevensies, lunch and an afternoon tea break. Who do I call if I'm late, stuck or lost? Please DO NOT try to cross the causeway if it is during the unsafe tide times, even if it looks like the tide is still low and it’s safe to cross, the road is about a mile long and things can change very quickly. The Coastguard gets called out to stranded vehicles multiple times a year, and attempting to cross the causeway at unsafe times is a serious risk to life. I have a disability - can I still dig with you? We strive to do our best to ensure everyone has a chance to experience archaeology, and have worked with many differently-abled participants on our sites. There are practical considerations for special accommodations in dig environments, and we are very happy to discuss these on a case-by-case basis and do whatever we can to ensure a safe and exciting experience for everyone. Please notify us as soon as possible of any disabilities so that we can discuss options for participation. If you're joining the Finds Team, please remember: LINDISFARNE IS A TIDAL ISLAND AND YOU CAN ONLY CROSS THE CAUSEWAY AT CERTAIN TIMES OF DAY, AND THESE TIMES CHANGE DAILY. If you're coming from the mainland, the first thing you need to do is check the start, finish and crossing times below, to make sure you can get on and off the island in time for the dig. Your first day in the Finds Lab is the most important, as you’ll need to complete the archaeological briefing before we can get you handling artefacts. Make sure you get to our meeting point (Holy Island C of E School) in plenty of time. Having said that, we have allowed 25 minutes from the earliest safe crossing time until the start of the day. This should be enough to cross safely, park and find your way to our meeting point, but if it takes you a bit longer, please don’t worry – take your time and don’t attempt to cross the causeway any earlier than is safe to do so – the most important thing is to make sure you cross safely! Whether you’re a newbie or an experienced artefact-handler, joining us for just a day or staying for the whole Finds week, we’ll do our best to make sure you have a once-in-a-lifetime experience. Part of the fun of archaeology is never knowing exactly what you’re going to find. Since you’ll be working on material that has come out of the trenches during the excavation, you could be handling all manner of artefacts – bone, stone, ceramic, and even environmental evidence. You’ll learn how to deal with different types of material, and get hands-on helping us to clean, identify, sort and quantify the artefacts as they emerge. If you're joining us for DigCamp, please remember: LINDISFARNE IS A TIDAL ISLAND AND YOU CAN ONLY CROSS THE CAUSEWAY AT CERTAIN TIMES OF DAY, AND THESE TIMES CHANGE DAILY. 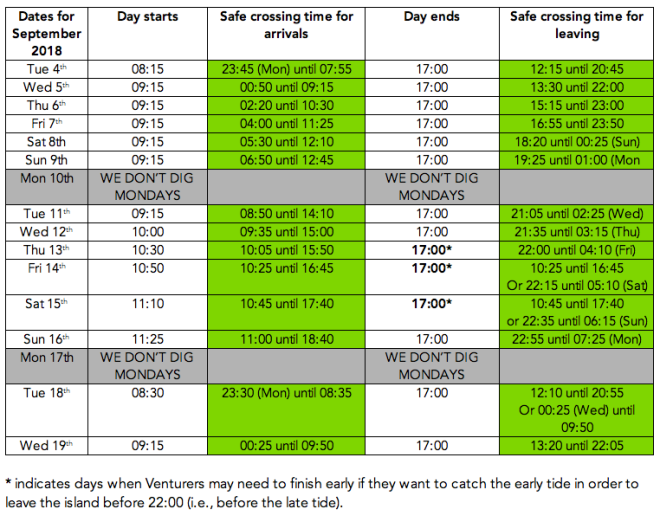 If you're coming from the mainland, the first thing you need to do is check the start, finish and crossing times below, to make sure you can get on and off the island in time for the dig. You need to complete an archaeological briefing before we can get you digging or handling artefacts. Make sure you get to our meeting point (Holy Island C of E School) in plenty of time. You really do get to be an archaeologist for the day! We’ll start by exploring the island, looking for clues about where King Oswald’s monastery might be. Then, we’ll show you how to identify different artefacts, and finally… we’ll show you how to dig! Once you’re all trained up, you’ll get to jump into the trenches alongside our professional archaeologists and help them excavate Lindisfarne’s amazing secrets. You’ll also get to record anything you find on CyberDig – our whizzy new digital archaeology app built just for kids – so that everyone else can see what you’ve found too. In one single day, you’ll get to discover one of the most important sites in Anglo-Saxon history… and have a bucket-load of fun! Who will we be digging with? DigCampers will be working alongside our professional archaeologists (some of whom you may have seen on Time Team or presenting the BBC’s Ancient Voices), and Fergus – the world’s best archaeological dog! We understand that the British weather doesn’t always come up trumps, so if the heavens open we’ll get out of the muddy field and into the warm indoor archaeology laboratory to examine, question and record real archaeological objects. We invite all our crowdfunders, friends and followers to visit us during the excavation. If you're planning to visit, please remember: LINDISFARNE IS A TIDAL ISLAND AND YOU CAN ONLY CROSS THE CAUSEWAY AT CERTAIN TIMES OF DAY, AND THESE TIMES CHANGE DAILY. If you're coming from the mainland, the first thing you need to do is check the start, finish and crossing times below, to make sure you can get on and off the island in time for the dig. Can I visit you during the excavation, even if I'm not part of the Dig Team or Finds Team? Absolutely! If you happen to be in the area during the excavation you are welcome to visit the site, we’d love to show you what we’re doing. If you want to be kept in the loop with everything we find, and what we do with it next, the best way to do this is to become a Digital Digger. You can find out how to do that here. You can visit the dig site, which is located just in front of the later medieval priory. Head there and you literally won’t be able to miss us! Alternatively, you can pop into the Finds Room, which is located at Holy Island C of E school. Please bear in mind that our dig schedule changes daily with the tides, and that we won’t be in the trenches 24 hours a day. But whenever you see archaeologists in the trenches, you’re welcome to stop and ask questions! When is it safe to cross the causeway onto the island? You can check the safe crossing times on Northumberland County Council’s website. Click here for the official tide timetable. Where should I stay? What are the local amenities like? What else do I need to know? Can you recommend some accomodation options? Holy Island is a very popular tourist destination and in the summer months, hotels and guest houses book up extremely quickly. We recommend that you book your accommodation for the dig as soon as possible. There are many places to rent a room on Holy Island. There is a great website to help you start looking for a place to stay here. On the mainland there are many places to choose from. The closest accommodation to the island is the Lindisfarne Inn, but a simple online search will turn up many options in the area. Camping is strictly forbidden on Lindisfarne, but there are some great camp sites nearby on the mainland. Can I hitch a ride, get a lift or share accommodation? You can get in touch with your fellow Venturers by joining the DigVentures Facebook Group Chat group. It’s a good place to say hello to the people you’ll be digging with, and make shared travel plans if you wish. Should I join the DigVentures Group Chat? If you’re on Facebook, you can join the DigVentures Group Chat. This is the place to say hello to your fellow Venturers, share memories, and ask people about making shared travel plans. Should I bring an Archaeology Skills Passport? If you are interested in recording your skills progression, we also recommend buying a BAJR Skills Passport. You can get them here. Should I bring my own trowel? We provide all the tools you need to be able to dig with us, but you might want to bring your own trowel, especially if you’re digging with us for a longer period of time. If you do decide to bring your ow trowel, it’s important to have the right kind. We suggest a WHS 4-inch pointing trowel. You can find these online at Past Horizons. What can I read to swot up before I arrive? If you want to start something light, but still historically rigorous, we’d recommend The King in the North, by Max Adams – it’s about King Oswald, who founded the very monastery we’re looking for. O’Sullivan, D, Young, R, 1995. English Heritage Book of Lindisfarne Holy Island, London: English Heritage. Foot, S, 2009. Monastic Life in Anglo Saxon England c. 600-900, Cambridge: Cambridge University Press. If you’ve got anything to recommend to your fellow diggers, tweet us at @TheDigVenturers! Are there any local amenities? Holy Island is a very small but lovely, but it does have several cafes, shops and pubs. There are also limited transport links from Berwick-Upon-Tweed. There are public toilets on the island. How will DigVentures ensure I am safe and happy on site? Our priority is to maintain a safe and friendly environment for our staff and participants. We love what we do, and we make a huge effort to welcome all participants to the world of archaeology with as much positivity and enthusiasm as possible. Our team hopes that everyone brings the same approach to our sites as we do, but we recognise that on very rare occasions things can go awry. With that in mind, DigVentures operates a ZERO TOLERANCE policy for aggressive, harassing or threatening behaviour, and takes matters of interpersonal communications very seriously. This applies to members of the public, volunteers and staff. Support and advice is available for staff and participants experiencing or witnessing bullying, harassment or discrimination; should you have an issue, please approach a member of DigVentures staff for assistance. For physical injuries we always have a trained first-aider on site, and we will go through a risk assessment when you join us, as in our experience, when people are aware of safety issues accidents are mostly avoided. You cannot dig with us unless you’ve had the health and safety briefing, so please make sure you are on time on your first day so we can go through this with you. What is Digital Dig Team? Digital Dig Team is DigVenture’s HLF-funded digital archaeological recording system. It is a customised digital recording system: think of it as an online version of the traditional paper context sheets used by archaeologists. Our team (including you) will be standing over the trenches with iPads, recording vital information including photos, plans and information about who did the digging. We’re putting our excavation online. This will allow us to report our primary data from the trenches every day in real time, and all of our experts, specialists and Venturers will have access to it through the internet. No need to wait a year for the site report: you can see the information as it happens! This new system is going to help archaeologists to do our jobs better, and also enable us to involve the public even more in our work. Digital Dig Team is the future of fieldwork – and we’ll be using it on all of our sites, as well as partner projects. What do I say if people ask me questions? Holy Island is a tourist attraction, and the site where we will be working is right in front of the abbey – it’s very visible and we will be in contact with the general public at all times. We encourage people to visit our sites even if they’re not digging with us, so it’s likely that you will come into contact with people who are curious during the dig. We will do our best to help you feel empowered and knowledgable enough to answer any questions people have for you, both on site and off site. We strongly encourage you to speak to people asking questions, after all, this is your archaeology, if you’re asked a question you don’t know the answer to, just call over a member of DV staff and we’ll help you! With that in mind, everyone who is part of the DigVentures project must be conscientious, polite and responsible in our communication with the public and use of buildings and shared spaces. Group clean-ups will be a regular activity, and we ask that everyone pitches in to make sure that we are clean and tidy. Can I post about the dig on social media? Yes! One of the most important parts of any DigVentures project is sharing what we’re doing with the rest of the world. We have followers all around the globe who love to see where we’re doing archaeology and who we’re working with. We will be broadcasting every day with blogs, tweets and on pretty much all other forms of social media. We encourage all of you who are active on Facebook, Twitter, Instagram etc. to join us in providing a stream of information right from the trenches, but please remember that you are representing DigVentures in your posts. We will do our absolute best to ensure that each of you has a fantastic time on site, but if you have any questions or concerns while you’re with us, please do speak to a member of staff before you post anything in the public domain. Ask a DV staffer to review your post before you hit ‘post’ if you have any questions or you’re unsure if it’s appropriate. It is the responsibility and obligation of all participants to ensure that they have adequate travel insurance covering their tickets, personal belongings and health. It is essential to confirm with your insurance provider that you are permitted to work in a voluntary capacity under their terms and conditions. What are the health and safety risks on site? We take the well-being of our staff and participants very seriously. There will be a certified First Aider present at all times for every dig, and all participants MUST complete the Medical forms and sign the Risk Assessment document before they can begin their experience. Both of these documents will be distributed on site. Every participant will be introduced to all DigVentures staff, and the Site Director will make the expectations clear regarding on-site behaviours. In the event that any participant violates the outlined conditions, or places any other participant in danger as a result of their activities, that person will be immediately asked to leave and will forfeit the remainder of their experience. Can you answer a question regarding my visa or passport? Participants are responsible for making sure their passports are up to date and for securing any necessary visas. In most cases your passport must be valid for a minimum of six months beyond your stay in the country you are visiting. Our dig experience may be based in a country for which you need a visa or you may also need a visa to travel through a country en route to your dig experience. If you are unsure about the applicable requirements, check with your travel company and/or the relevant embassy or consulate. If you do have to apply for a visa for your dig experience, always ask for a tourist visa (unless stated otherwise in the dig Info Pack). Remember that the purpose of your visit is for vacation, holiday or travel. Immigration officials do not always understand, and words such as ‘working,’ ‘volunteering,’ ‘research’ or ‘archaeological dig experience’ can raise questions concerning the country’s foreign labour laws and/or questions about official research permits and credentials, etc. Be sure to allow plenty of time for the visa approval process, which can weeks or even months! Note: If you are a citizen of one of the countries in the U.S. Visa Waiver Program and are traveling to the United States or through the United States en route to another country, you must complete an Electronic System for Travel Authorization (ESTA) form online at least 72 hours before you depart for the U.S.
Medical decisions are the responsibility of each volunteer and decisions about which vaccinations to receive should be made between you and your doctor. Health conditions around the world are constantly changing, so keep informed and consult your physician, a local travel health clinic, the U.S. Centers for Disease Control and Prevention or The World Health Organization for the latest health information for travellers. It may be worth checking that your tetanus vaccination is up to date prior to arriving on site. What happens if DigVentures cancels? If DigVentures cancels your dig experience for any reason within DigVentures’ control, we will refund 100% of what you have contributed for the experience at the time of cancellation. Alternatively, you may prefer that your contribution can be carried over to another of our dig experiences. DigVentures can take no responsibility for any cancellation or amendment penalties that your travel company may charge you if you have to change your travel plans as a result of cancellation by DigVentures. Your travel arrangements are subject to the terms and conditions of the company through which you booked. Participants are encouraged to buy flexible, refundable tickets, and we strongly advise Trip Cancellation insurance.